Made in the USA and ruggedly constructed, Keen submerged arc flux storage and rebake ovens are available in a variety of capacities to suit the most rigorous subarc welding operations. Our flux ovens have industry-leading heat up times due to our proprietary design, and can be found in a wide variety of industries across the world. We also offer customized solutions for unique subarc operation requirements. Call us today 1-888-512-2870. What is subarc flux and what is submerged arc welding (SAW)? Why do I need to store subarc flux in a heated oven? What are the proper storage and rebaking guidelines for subarc flux? What is the difference between subarc flux holding and subarc flux rebaking? 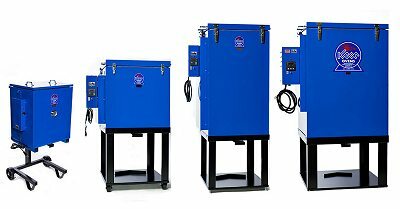 What are the key differences between welding flux holding ovens and welding flux rebake ovens? How can I determine the amp draw for a particular model? Submerged arc welding (SAW) is a common welding process that is frequently used in the structural and vessel construction industries. The process requires a tubular or consumable solid electrode that is continuously fed into the work area using fully-automatic or semi-automatic methods. As the electrode is fed into the arc and melted, a layer of granular material provides a protective cover beneath which the welding occurs. Called flux, this fusible material consists of lime, silica, manganese oxide, calcium fluoride, and other compounds. The flux forms a hardened layer after it is heated and becomes molten. In this melted state the flux becomes conductive, thus enabling it to supply a constant current between the electrode and the welding work. The remainder of the flux is recovered and reused, unless it has become contaminated. The granular flux used in SAW serves several functions. In addition to providing a protective cover over the weld, the flux shields and cleans the molten puddle. The flux also affects the chemical composition of the weld metal, the weld bead shape, and the mechanical properties of the weld. Another function of granular flux is to act as a barrier that contains and concentrates the heat into the weld area thus enabling deeper weld penetration. In order to answer this question, it is pertinent to describe the four types of welding fluxes that are commonly available: fused, bonded, agglomerated and pre-mixed fluxes. can be removed at a low temperature oven setting of 300°F. is used instead of a liquid binder. of two or more bonded or agglomerated fluxes. Just as stick welding electrodes readily pick up moisture from the surrounding atmosphere, the same applies to bonded welding fluxes that are comprised mostly of dry, powdered ingredients. As described above, the purpose of flux is to clean and shield the weld area from impurities. If moisture has contaminated the flux, hydrogen is released into the metal when heat is applied. When the weld cools, it can become brittle, crack and/or develop pinholes. Moisture-contaminated flux can also accelerate corrosion to certain metals like aluminum and must be kept dry throughout the welding process. Welding flux holding ovens and rebake ovens are an indispensable addition to any subarc welding operation to help ensure quality welds. Our flux holding ovens and rebake ovens are suitable for almost any flux heating application that is required for today’s professionals. For specific storage and rebake temperature guidelines, we recommend contacting the welding consumable manufacturer directly. It is also important to check with local welding codes and/or ask a welding inspector to provide some information. Welding standards change frequently, and each manufacturer often provides a different recommendation regarding welding consumable storage. Check the packaging and also manufacturer websites for information. Keen offers a wide range of products to handle almost any welding consumable storage requirement. What is the difference between subarc flux holding/storage and subarc flux rebaking/reconditioning? Generally, there are two involved with the proper maintenance of subarc welding flux: holding (also called storing) and rebaking (also called reconditioning). The holding process refers to the long-term* heated storage of welding flux to maintain factory-fresh dryness. Storing the flux at elevated temperatures prevents atmospheric moisture contamination of the hygroscopic granules. There are various temperature requirements according to the type of flux and also that are also set forth by welding codes. For specific holding temperature guidelines, please contact the manufacturer of your welding consumable. The rebaking process refers to the short-term*, high temperature heating of subarc flux that has been contaminated by atmospheric moisture. The rebaking process “reconditions” the welding flux, meaning it bakes out the moisture that has been absorbed thus restoring the flux so it is suitable for reuse. For specific rebake temperature guidelines, please contact the manufacturer of your consumable. * - In relation to our products, we consider long-term to mean 24 hours/day 7 days/week. Keen ovens are specifically designed according to the temperature range of the process, and the amount of subarc flux to be stored. The standard holding ovens are designed to accommodate a maximum temperature of 550F and the rebake ovens are designed to reach 999F. The higher temperature ovens have larger wall thicknesses to accommodate more insulation and digital programmable temperature controllers. More information is available on the individual product pages. Please select a product from the chart above and you will be taken to the product page which has digital photos of each flux oven and technical specifications.